Bring dull lawns back to life – suitable for ALL lawns types. Creating the perfect lawn does not have to be a constant challenge or require a great deal of maintenance. ecofective Natural Lawn Feed and Root Enhancer offers an organic based feed to meet all your lawn care needs without the need for chemical feeds. Highly effective, the mycorrhizal fungi work symbiotically with the roots, encouraging a strong root system whilst improving resistance to drought conditions and stress. The mini fertiliser granules naturally phase release, giving long-lasting effects over 8-10 weeks, whilst the seaweed extracts are a natural tonic for the lawn. There is no strong smell as found with many other organic alternatives and grass grows thicker and stronger to out-compete the growth of weeds and moss. 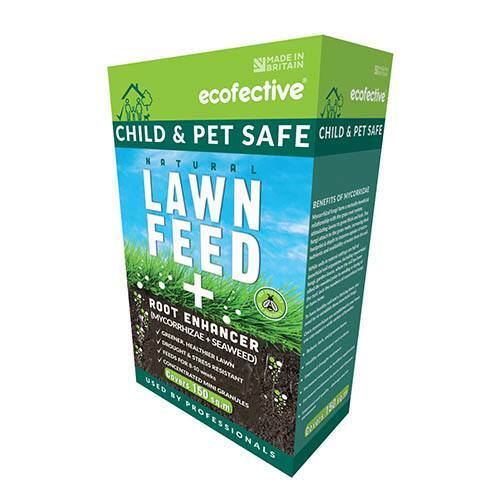 Child, pet and bee safe, ecofective Natural Lawn Feed + Root Enhancer is used extensively by professional landscapers and offers 150sq.m of coverage from just 4kgs. For best results apply between March – September, visible results in 7-10 days. Promotes a greener, thicker lawn and improves soil structure. Treat weeds in your lawn, wait 7-10 days before using the feed. If mowing before application, do this 4 days before applying to reduce risk of burning the grass blades from the fertiliser or sun. If very dry weather, it is always a good idea to lightly water the lawn once fertiliser is applied, this helps the fertiliser to do its work. Suitable for all lawn types. Coverage from 1 box – 150 sq.m. Apply between March – September every 8-10 weeks when no frost is present or expected. The feed can be applied during drought conditions, if watered in. Mark up the area before application – this helps to give an even application of the product. Before opening the box shake the contents thoroughly as they may settle in transit. Pull tab on the side panel to open for easy application. Apply 27g to 1sq.m (about a handful) via box or hand.